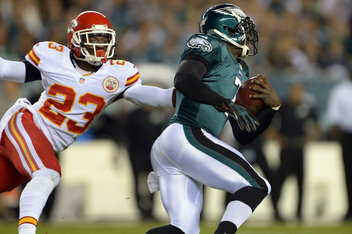 The Kansas City Chiefs crushed the Philadelphia Eagles 26-16, forcing 5 turnovers and keeping Chip Kelly's offense an afterthought. Donnie Avery caught 7 passes for 141 yards and Jamaal Charles ran for 92 in the Chiefs win. LeSean McCoy was the only bright spot in the Eagles' loss. He rushed for 158 yards on just 20 carries with a touchdown. He is the league's leading rusher as of last Sunday, and looks to be for this week as well. Andy Reid returned to Philadelphia as the head coach of the Chiefs, he won 140 games as the Eagles head coach. The Eagles officially retired Donovan McNabb's #5 jersey in a halftime ceremony.